Here are the basic bits of information that you need to know about high speed doors for your industrial application - what they are, why they are valuable for a variety of industries, and what characteristics you should look for. What are high speed doors? High speed doors are pretty much self-descriptive! They're faster versions of conventional door systems such as roller doors, sectional door, PVC fabric door, or roller shutter. In order to operate at speed, the design of the high speed door is critical to ensure longevity of parts, most efficient energy consumption, and reliability in high usage. 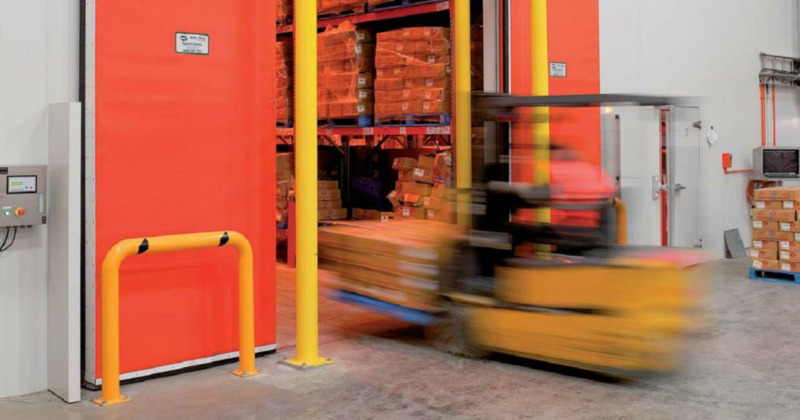 High speed doors are typically designed to integrate with the traffic movements within your organisation, whether that be pedestrian traffic, forklifts, vehicles or automated conveyors. For this reason, it is critical to scope the design and selection of the high speed door and ancillary activation systems to best match the traffic characteristics, and avoid costly collisions. A key requirement is that they open very fast and close slowly. Manufacturers may install other features to serve this purpose. For example, Movidor has an integrated traffic warning system that alerts the driver, via flashing LED lights, when a door is about to close. Some versions use a spiral guiding system, which keeps the door blade apart through a whole operating cycle. Also, a counterbalance system sometimes forms part of the door's construction. It is designed with spring or weight mechanisms in the side frames so that the opening smoother and that there is an emergency opening function. Where are high speed doors used? By ensuring doors are kept closed for the maximum time, with good perimeter sealing when closed, energy and temperature losses through doorways can be reduced, optimum operating rythyms can be achieved, and cross contamination risks can be minimised. However, in a facility with significant traffic movements, be it pedestrians, forklifts or trucks, maintaining closed doors without serious disruption to your operations can be an Operations Managers nightmare! How can this be overcome? With High Speed Doors! High speed doors can play an important role in meeting all the energy and hygiene control objectives of an organisation -without compromising productivity or ease of access. Pharmaceutical - for positive pressure regulation, hygiene control. As an architectural feature, high speed doors can be made to match the aesthetic demands of the building. Managers will install high speed doors for security purposes, or to insulate heat and noise. What should you look for in your high speed doors? They are non-residential powered doors. They have rolling, folding, sliding, and swinging characteristics. Made-to-order for exact size and custom features. Designed to withstand equipment impact (break away if accidentally hit by a vehicle). For example, Movidor high speed doors utilise a unique curtain relocation system that inserts the door curtain back into its guides in the event of accidental impact. Designed to sustain heavy usage with minimal maintenance. Doors fitted with counter-balance springs, pulleys and wire cables may require more ongoing maintenance than those without. Make sure your manufacturer satisfies the above criteria before you buy your high speed doors. We offer a variety of high speed doors across a range of industries. If you are looking for roller doors, you may want to download our buyer's guide to roller door selection.